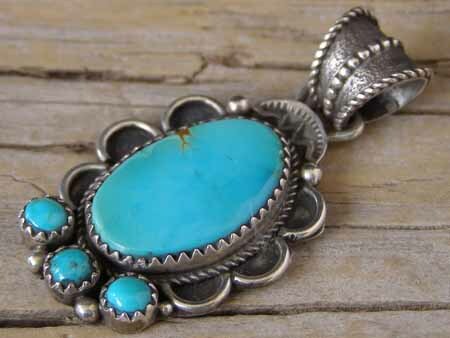 Reminiscent of the smithing style of Leon Martinez, this gorgeous pendant by Navajo silversmith Richard Jim is set with a free-form stone of natural, untreated Royston turquoise highlighted by three small rounds below it. The stones are set in serrated bezels. Hallmarkd Richard O. Jim and stamped Sterling on back. Dimensions of pendant (excluding bale & jump ring): 1 1/4" x 7/8"